John Rolfe (1585–1622) was one of the early English settlers of North America. He is credited with the first successful cultivation of tobacco as an export crop in the Colony of Virginia. Rolfe was born in Heacham, Norfolk, England, as the son of John Rolfe and Dorothea Mason, and was baptized on 6 May 1585. At the time, Spain held a virtual monopoly on the lucrative tobacco trade. Most Spanish colonies in the New World were located in southern climates more favorable to tobacco growth than the English settlements, notably Jamestown. As the consumption of tobacco had increased, the balance of trade between England and Spain began to be seriously affected. Rolfe was one of a number of businessmen who saw the opportunity to undercut Spanish imports by growing tobacco in England's new colony in Virginia. He had somehow obtained seeds to take with him from a special popular strain, then being grown in Trinidad South America, even though Spain had declared a penalty of death to anyone selling such seeds to a non-Spaniard. A project of the proprietary Virginia Company of London, Jamestown had been established by an initial group of settlers on 14 May 1607. This colony proved as troubled as earlier English settlements. Two return trips with supplies by Christopher Newport arrived in 1608, while another large relief fleet was dispatched in 1609, carrying hundreds of new settlers and supplies across the Atlantic. Heading the Third Supply fleet was the new flagship of the Virginia Company, the Sea Venture, carrying Rolfe and his wife, Sarah Hacker. The Third Supply fleet left England in May 1609 destined for Bermuda with two small ships to continue the voyage to Jamestown. A number of passengers and crew, however, did not complete this journey. Some had died or been killed, lost at sea (the Sea Venture's long boat had been fitted with a sail, and several men sent to take word to Jamestown, and they were never heard from again), or left behind to maintain England's claim to Bermuda. Because of this, although the Virginia Company's charter was not extended to Bermuda until 1612, the Colony at Bermuda dates its settlement from 1609. Among those left buried in Bermuda were Rolfe's wife and his infant daughter, Bermuda Rolfe. In May 1610, the two newly constructed ships set sail from Bermuda, with 142 castaways on board, including Rolfe, Admiral Somers, Stephen Hopkins, and Sir Thomas Gates. On arrival at Jamestown, they found the Virginia Colony almost destroyed by famine and disease during what has become known as the Starving Time. Very few supplies from the Third Supply had arrived because the same hurricane that caught the Sea Venture badly affected the rest of the fleet. Only 60 settlers remained alive. It was only through the arrival of the two small ships from Bermuda, and the arrival of another relief fleet commanded by Lord De La Warr on 10 June 1610, that the abandonment of Jamestown was avoided and the colony survived. After finally settling in—although his first wife, the English-born Sarah Hacker and their child had died prior to his journey to Virginia–Rolfe began his long-delayed work with tobacco. In competing with Spain for European markets, there was another problem beside the warmer climates the Spanish settlements enjoyed. The native tobacco from Virginia was not liked by the English settlers, nor did it appeal to the market in England. However, Rolfe wanted to introduce sweeter strains from Trinidad, using the hard-to-obtain Spanish seeds he brought with him. In 1611, he was the first to commercially cultivate Nicotiana tabacum tobacco plants in North America; export of this sweeter tobacco beginning in 1612 helped turn the Virginia Colony into a profitable venture. He named his Virginia-grown strain of the tobacco "Orinoco", possibly in honour of tobacco popularizer Sir Walter Raleigh's expeditions in the 1580s up the Orinoco River in Guiana in search of the legendary City of Gold, El Dorado. The appeal of Orinoco tobacco was in its nicotine, and the conviviality of its use in social situations. In 1612, Rolfe established Varina Farms, a plantation along the James River about 30 miles (50 km) upstream from Jamestown and across the river from Sir Thomas Dale's progressive development at Henricus. The first harvest of four barrels of tobacco leaf was exported from Virginia to England in March 1614. Soon afterwards, Rolfe and others were exporting vast quantities of the new cash crop. New plantations began growing along the James River, where export shipments could use wharfs along the river. 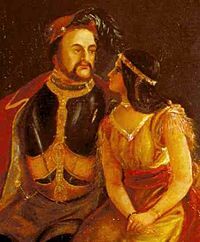 Rolfe married Pocahontas, daughter of the local Native American leader Powhatan, on 5 April 1614. A year earlier, Alexander Whitaker had converted Pocahontas to Christianity and renamed her "Rebecca" when she had her baptism. Richard Buck officiated their wedding. Powhatan gave the newlyweds property just across the James River from Jamestown. They never lived on the land, which spanned thousands of acres, and instead lived for two years on Rolfe's plantation, Varina Farms, across the James River from the new community of Henricus. Their marriage created a climate of peace between the Jamestown colonists and Powhatan's tribes for several years; in 1615, Ralph Hamor wrote that "Since the wedding, we have had friendly commerce and trade not only with Powhatan but also with his subjects round about us." Their son Thomas was born on 30 January 1615. John and Rebecca Rolfe traveled to England on the Treasurer, commanded by Samuel Argall, in 1615 with their young son. They arrived at the port of Plymouth on 12 June. Rebecca was widely received as visiting royalty, but settled in Brentford. However, as they were preparing to return to Virginia in March 1617, Rebecca became ill and died. Her body was interred in St George's Church, Gravesend. Their two-year-old son Thomas survived, but was adopted by Sir Lewis Stukley and later by John's brother, Henry Rolfe. John and Tomocomo returned to Virginia. In 1619, Rolfe married Jane Pierce, daughter of the English colonist Captain William Pierce. They had a daughter, Elizabeth, in 1620, who married John Milner of Nansemond, Virginia, and died in 1635. Rolfe died in 1622 and his widow Jane married Englishman Captain Roger Smith three years later. The land given by Powhatan (now known as Smith's Fort Plantation, located in Surry County) was willed to Rolfe's son with Pocahontas, Thomas, who in 1640 sold at least a portion of it to Thomas Warren. Smith's Fort was a secondary Fort to Jamestown, begun in 1609 by John Smith. Thomas, who had grown up in England, married Jane Poythress. Her English parents were Francis Poythress and Alice Payton. They had one child, Jane, who married Robert Bolling in 1675 and had a son, John, in 1676. She died later that year. The strain of tobacco cultivated by Rolfe was the export cash crop that helped make the Virginia Colony profitable. It was the mainstay of the farming plantations for generations. Huge warehouses, such as those on Richmond's Tobacco Row, attest to its popularity. Even almost 400 years later, tobacco figures prominently in Virginia's economy. John Rolfe Drive, in the town of Smithfield in Isle of Wight County, Virginia, connects Battery Park Road with Magruder Road, and is named for Rolfe. Rolfe in Pocahontas County, Iowa, is named for Rolfe. Rolfe wrote in 1619 of the incidental introduction of enslaved Africans to Virginia from a passing ship, recording that "there came in a Dutch man-of-war that sold us twenty negars" on 31 August of that year. In 1961, the Jamestown Foundation of the Commonwealth of Virginia (now the Jamestown–Yorktown Foundation) offered a $500 award for "the best historical information" on Rolfe's "appearance and mannerisms". He was portrayed by John Stephenson in TV Reader's Digest 1955 episode "America's First Great Lady". In Disney's 1998 direct-to-video animated musical film Pocahontas II: Journey to a New World, he is voiced by Billy Zane. Rolfe is portrayed by Christian Bale in the 2005 film The New World. ^ Love and Hate in Jamestown David Price, 2007, p. 186. ^ Winkler, Wayne (2005). Walking Toward The Sunset: The Melungeons Of Appalachia. Mercer University Press. p. 42. ISBN 0-86554-869-2. ^ Stebbins, Sarah (2010). "Pocahontas: Her Life and Legend". ^ Snow, Megan (May 2003). "Thomas Rolfe". Historic Jamestowne. National Park Service. Retrieved 31 August 2011. ^ Pecquet du Bellet, Louise (1907). "Bolling Family". Some prominent Virginia families. Lynchburg, VA: J.P. Bell Co. p. 304. Retrieved 31 August 2011. ^ "The Descendants of Pocahontas: An Unclosed Case", by Elizabeth Vann Moore and Richard Slatten, Magazine of Virginia Genealogy, XXIII, no.3, pp.3–16, cited by John Frederick Dorman, Adventurers of Purse and Person, 4th ed., Vol. 3, p.26, fn23-24. Moore and Slatten traced the suggestion that his wife was a Poythress back to a comment by W. G. Stanard in "Abstracts of Virginia Land Patents", Virginia Historical Magazine(I, 1894, 446–447): "His wife is said to have been a Miss Poythress (if so, doubtless a daughter of Francis Poythress." According to Moore and Slatten, Stanard cited as evidence handwritten notes on the flyleaf of a copy of A Complete Collection of All the Laws of Virginia Now in Force Carefully Copied from the Assembled Records (London, 1682, now in the Library of Virginia. Moore and Slatten state: "Interestingly, Thomas Rolfe here is recorded as married to a 'Miss Payers'. We recall that in John Rolfe's will the name of his third wife is spelled Pyers (Peirce) and that it was John who married a "Jane". Here again, a Bolling descendant confused the son with his father. Not recognizing the name 'Payers' as another variant of Peirce, someone searched the records for a name beginning with 'P' and having a 'y' in the first syllable. Francis Poythress lived in adjacent Charles City County and his name ended in s! Stanard wrote, 'His wife is said to have been a Miss Poythress (if so, doubtless a daughter of Francis Poythress).' (VMHB I, 446) Wyndham Robertson, a Bolling descendant, wrote in Pocahontas Alias Matoke and Her Descendants (Richmond, 1887), 'I adopt "Jane Poythress" (not "Poyers") whom he is stated in the Bolling Memoirs to have married in England.' He added in justification of his charming adoption of an ancestress, '...no such name as "Poyers" is anywhere known ... the family of Poythress was already settled in Virginia.' ... The result has been the acceptance of a non-existent personage, 'Jane Poythress', in the Bibles of Virginia genealogy, as the bona fide ancestress of many illustrious Virginians. Who the wife (or wives) of Thomas Rolfe may have been remaining an unanswered question."